Comments recently asking how the NiMH chemistry fared beyond the first 1000 cycles was a question i asked myself back in the day as well, so a second set of 1000 cycles were run but results were not posted til now. After a second 1000 cycles the NiMH capacity faded an additional 5%, dropping to 58% of rated capacity from 63% after the first 1000 cycles. 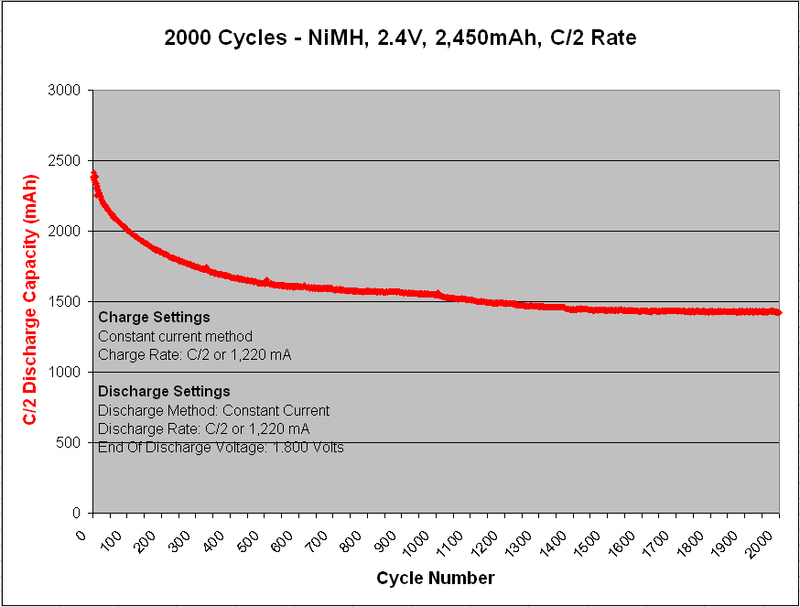 The NiMH chemistry held up well in terms of cycle life when not abused or over-heated by the charger which in-practice can be a difficult thing to do with NiMH battery types due to difficulty at detecting and terminating a full charge correctly and preventing damage from over-heating, especially at faster charge rates such as C/2 and without the use of a temperature sensor. The PCBA 5010-4 battery analyzer uses a custom ‘voltage only’ method of full-charge termination with multiple redundant detection methods for NiMH and NiCd chemistry types developed over ~15 years which now demonstrates its effectiveness in life cycle testing by not overheating the cells or causing venting of electrolyte and capacity loss other than by what seems to be normal loss as a function of normal use. The increasing demand of energy-efficient, safe, and low-cost batteries is the key factor driving the growth of the lithium ion battery market. The market was valued at USD 23.51 Billion in 2015 and is expected to grow at a CAGR of 16.6% between 2016 and 2022. The base year considered for the study is 2015 and the forecast period is between 2016 and 2022. We CTECHI Group(www.superlithiumbattery.com) is a leading high quality lithium thionyl chloride batteries, lithium manganese dioxide battery ( Li-MnO2 Primary Battery ) and li socl2 battery distributor and exporter in China, we are not only focus on provide single cell but provide battery assembly and do OEM service for customers, CTECHI has captured 80 percent of overseas markets in the past 16 years with more than 2000 reliable customers in our customer management system, which has been being one of the leading enterprises with the most complete category in China’s battery industry.